It's true, we did most of the touristy things in Paris. 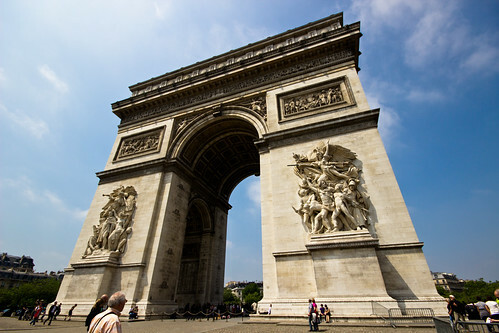 It had been my first visit in 18 years, and R.'s first ever, so the Arc de Triomphe was definitely on the agenda. But first things first: lunch. While tempting, I was afraid that many of the cafes and eateries along Champs-Élysées would be nothing more than tourist traps, so I consulted our Rick Steves guide, which had mentioned the casual bakery chain Brioche Dorée, which seems like it would be a nice, relatively inexpensive option. (We had some splurge meals planned, so balancing them out with good, inexpensive options was important.) Turns out Brioche Dorée is already breaking into the US market; I saw one at the Charlotte airport en route to Paris, and there is even one at the University of Pittsburgh, but it is located inside the University Club which only faculty and staff can access. I suspect, however, that we'll be seeing this French cafe popping up for the general Pittsburgh public soon. 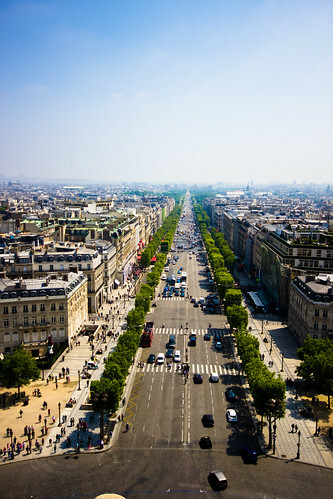 We visited the location that's just a few steps from Arc de Triomphe on Champs-Élysées (there is another one several blocks down as well). We sat upstairs and watched the people on the street. For lunch, Brioche Dorée offers what I think is a pretty good deal: For 9 euros I got a Rustique Champetre sandwich, with prosciutto, arugula, tomatoes, and cheese (or your choice of any sandwich), a sparkling water, a Chocolate Banana Tart for dessert, and a cup of tea (or coffee, if you so choose). 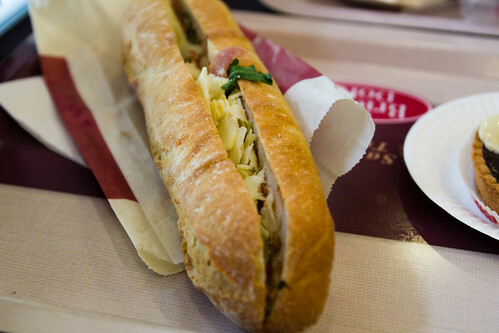 The sandwich was quite good; I really liked the combination of the fillings, but personally I'm not a French baguette kind of gal, though that's of course just a matter of personal taste. 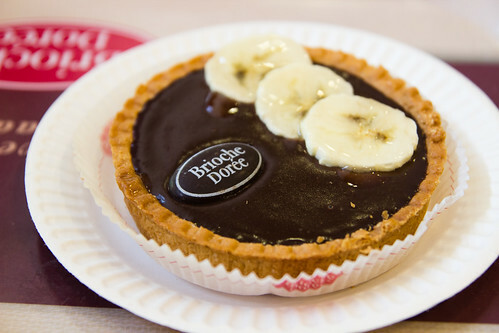 The chocolate banana tart was delicious, though I expected nothing less from pastries in France. 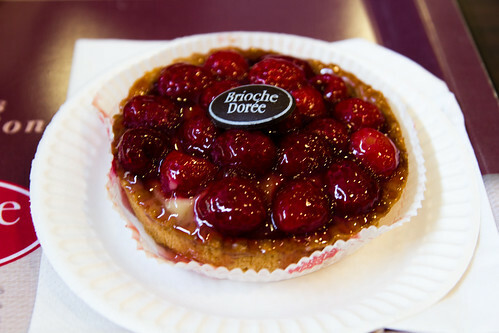 R. had a similar combo, and I managed to snap a photo of his Raspberry Tart. And here is something I like a lot about restaurants in Paris in general: At the end of a meal, they don't give you hard mint candy, which I never partake in anyway because I just don't like those hard candies. 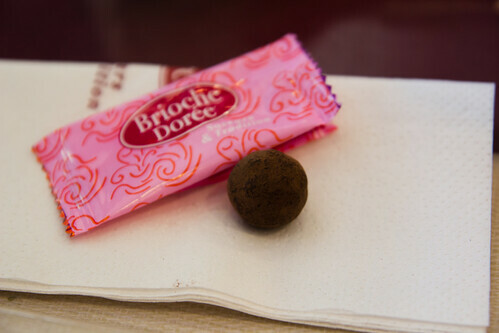 Instead, at Brioche Dorée, we got these malt candies. Yum! We had also gone to another Brioche Dorée location for breakfast one morning and their Pain au Chocolat is like a baked chocolate pillow of heaven! I really wish I had taken a picture!